Bank Negara Malaysia’s Monetary Policy Committee begins its first meeting of the year on Wednesday, 23 January, a two-day meeting the outcome of which will be unveiled around 3pm local time on Thursday. We are part of 20 analysts surveyed by Bloomberg, all forecasting no change to the overnight policy rate from the 3.25% level it’s been at since the last move of a 25 basis point hike a year ago. What’s changed since the previous BNM meeting in early November? There has been some good news for Asia’s net oil exporting economy. After crashing more than 40% since October, the global crude oil price started to move higher in late December. The country’s exports and manufacturing growth gained some strength in the final quarter of 2018, while domestic demand remained supported by a benign consumption tax and low inflation. This underpins our view of better GDP growth of 4.6% in 4Q18, up from 4.4% in the previous quarter, which was the slowest in eight quarters. The lack of price pressure is evident from ultra-low consumer price inflation, which averaged 0.5% year-on-year since the GST elimination in June. 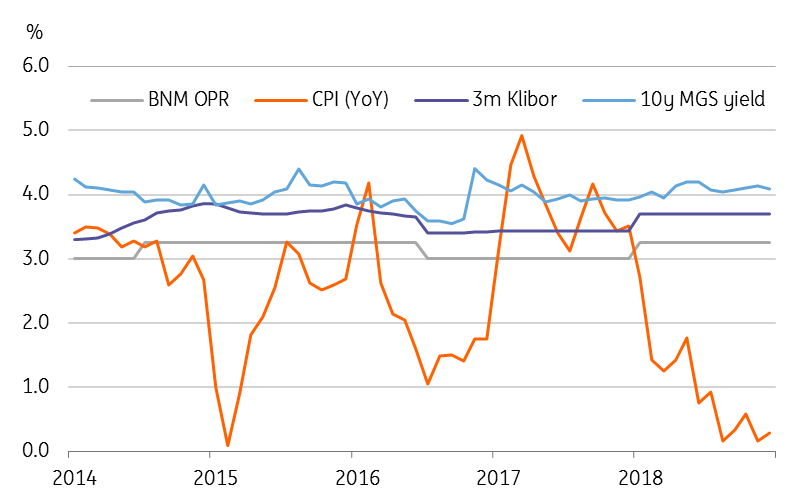 December CPI data due on the same day as the BNM policy decision is unlikely to show any departure from this trend. The external factors (trade war, China slowdown, oil) will weigh on the economy in the current year. However, the domestic demand-friendly policies will prevent a significant shock to GDP growth. We forecast 2019 growth at 4.5%, barely a slowdown from an estimated 4.7% last year. 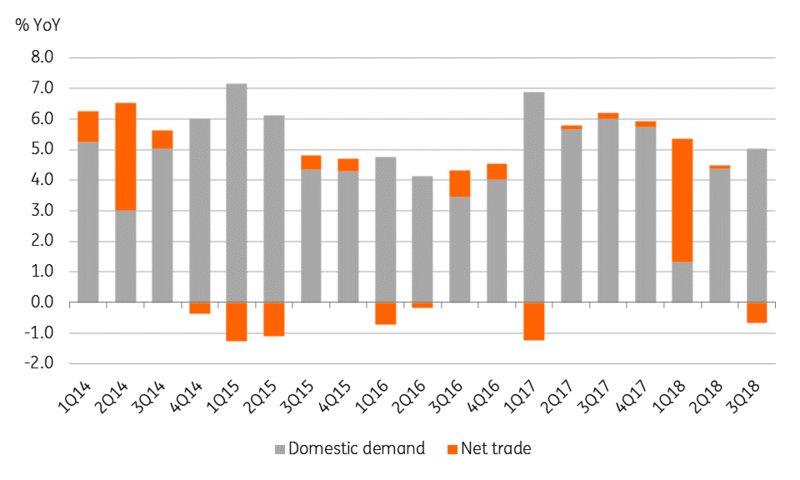 However, the official forecast of 4.9% growth this year isn’t impossible in the event of a renewed boost to investment from any trade diversion. Meanwhile, the lingering impact of the consumption tax reforms should keep inflation subdued through mid-2019 when the impact from GST elimination moves out of the base of comparison. Beyond that, inflation is likely to accelerate to 2%. The official inflation forecast range for this year is 2.5-3.5%, which will take a significant thrust from either the demand or the supply sides, neither of which is our baseline. Against such a backdrop, we believe the BNM policymakers will assess economic risks being fairly balanced between growth and inflation. We maintain our forecast of no change in monetary policy throughout 2019, which is also the consensus view.